Conquering the desktop. The premium HP Envy dv7-7200 makes a bid at being the go-to entertainment center. This 1200 Euro (~$1600) device is put through its paces to figure out its strengths and weaknesses. Read on to find out if it gets our recommendation. The HP Envy dv7-7202eg is a desktop replacement device. Performance running Windows 8 is very good. In the the PCMark 7 benchmark, our review sample reached a score of 2645 points, and is level with the Lenovo IdeaPad Y580 (2646 points) and the Acer Aspire S3-391-53314G52add (2656 points). As the dv6 and the dv7 have the same hardware, it isn’t surprising to find similar benchmark results for both the laptops. The Envy dv7-7202eg certainly isn't lacking storage capacity. The notebook has a total of two 2.5-inch Hitachi Travelstar 5K750 HTS547575A9E384 hard drives with a capacity of 750 GB each. One of these contains the operating system and the recovery partition, while the second drive is completely empty. Both drives are 5400 rpm drives featuring 8 MB of cache. The HDDs use the SATA II connector which is limited to a bandwidth of 3GB/s. Compared to 7200 rpm drives, the Hitachi drives may be slower but are no slouches when we benchmarked them. 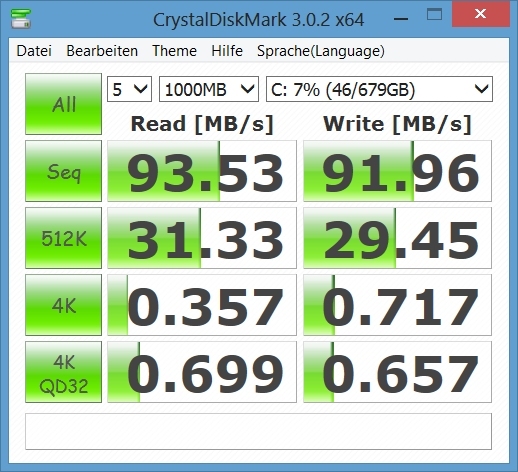 The CrystalDiskMark benchmark results show a read of 93.53 MB/s and HD Tune reports an average transfer rate of 75.2 MB/s. 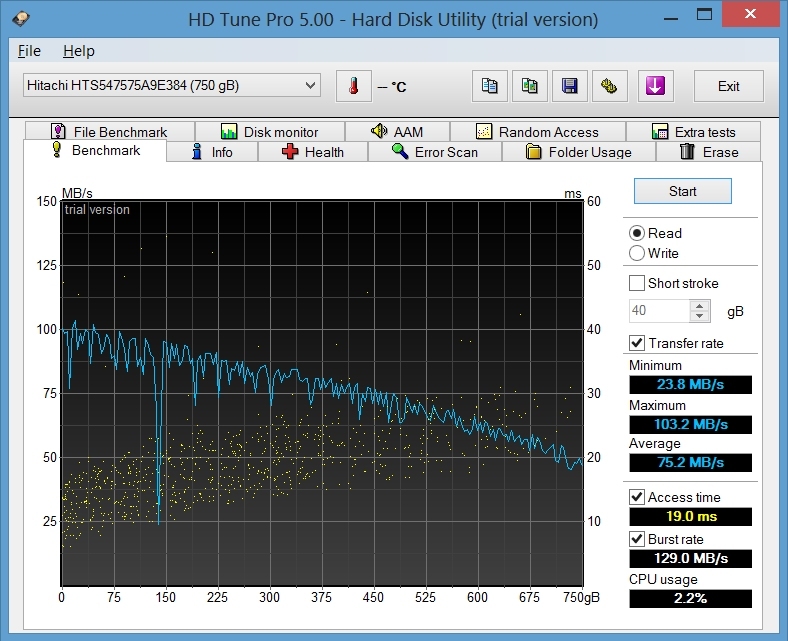 Considering the 1200 Euro price tag, an SSD instead of one of the hard drives would have been a welcome change though. The HP 3D DriveGuard monitors the accelerometers of both drives recognizing sudden shocks, in which case, the tool parks the read and write heads of the Hitachi HDDs in order to avoid the data on them getting damaged. There are two graphic solutions inside the dv7-7202eg - the Intel HD Graphics 4000 integrated into the processor and the mid-range graphics card Nvidia GeForce GT 630M. Nvidia provide a very interesting and polished software switching solution that allows the laptop to change the GPU for a particular application on the fly. The applications can also be specified to use a certain GPU in the profile. Generally, the Intel GPU has priority when the notebook is on battery power, while the Nvidia GPU is used for more demanding applications like games. The HP Envy dv6-7202eg also had the identical CPU and GPU configuration. It came as no surprise that both notebooks performed almost identically in the 3D benchmarks. and both get left behind when you compare the results of the Wortmann Terra Mobile 1773Q (Intel Core i5 3210M) which possesses a more potent graphics card in the form of the Nvidia GeForce GT 640M. Thanks to the Nvidia GeForce GT 630M GPU, the HP Envy dv7-7202eg can also be used to play some of the latest games. Almost all the games were playable without any judders during our test at medium quality settings and a resolution of 1366 x 768 pixels. Demanding games like Battlefield 3 do however push the dv7-7202eg to its limits, the game framerates falling well below playable levels at medium detail settings.